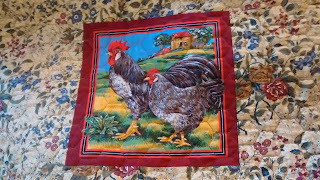 While I was at one of my retreats last summer, I met two of the nicest, funniest, crazy, fabulous quilters. They are Deb and Barb. Deb and Barb had been friends for a long time and have been going on retreats together for a long time. They both live in Minnesota. Recently Barb sent me an email after reading my UFO and Flimsy post. She asked me if I would be interested in participating in a challenge with her and Deb. Well, of course I was. 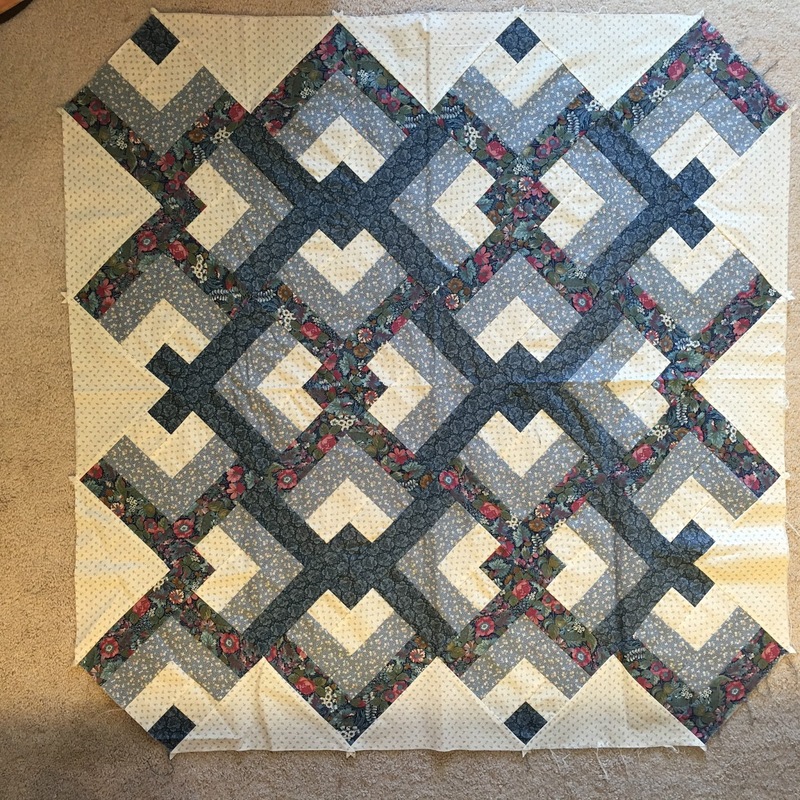 I can't pass up a challenge, especially a do-able one. 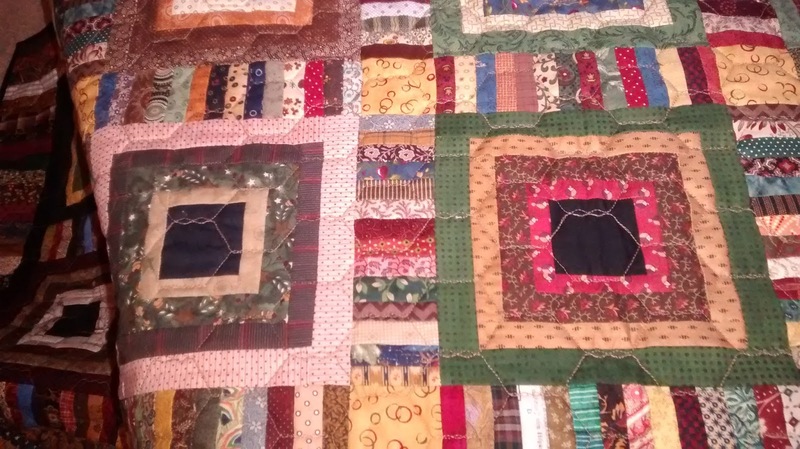 She challenged us to pick just one item on our UFO and Flimsy list each month, send a picture to her and Deb at the beginning of the month, complete it sometime during the month, and then send an updated picture showing the project completed by the last day of the month. 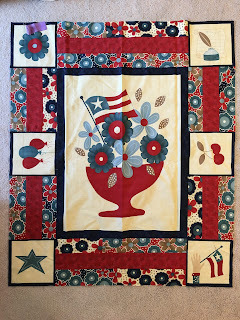 If I didn't complete mine, I had to quilt one of their projects. 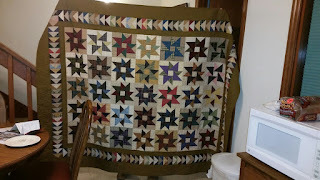 If they didn't complete theirs, they had to quilt one of my projects. I completed mine by the skin of my teeth. 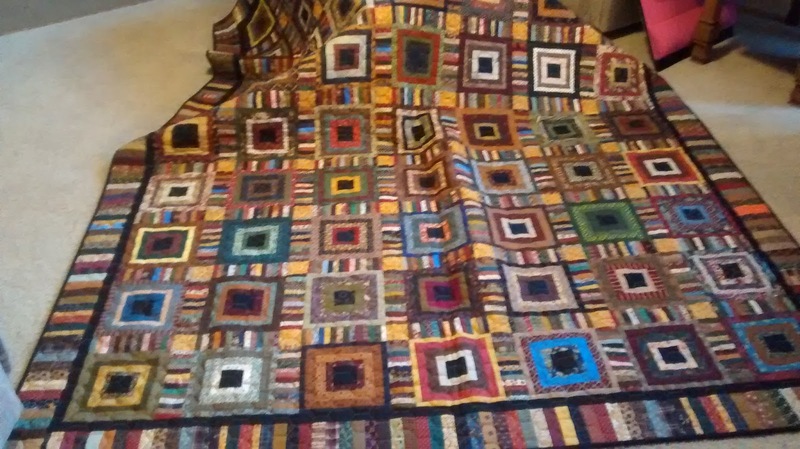 I got it finished last Thursday. You probably remember it here. Deb emailed me on Sunday morning. She had hers done and "not a moment too soon". 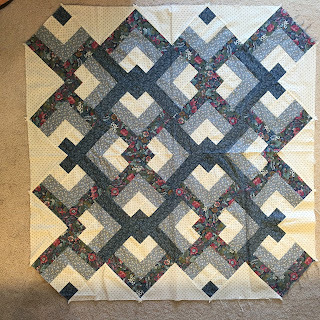 This is the Hen House Chicks Block Exchange. She said she had to add a picture of a few of them on the back. I love it! 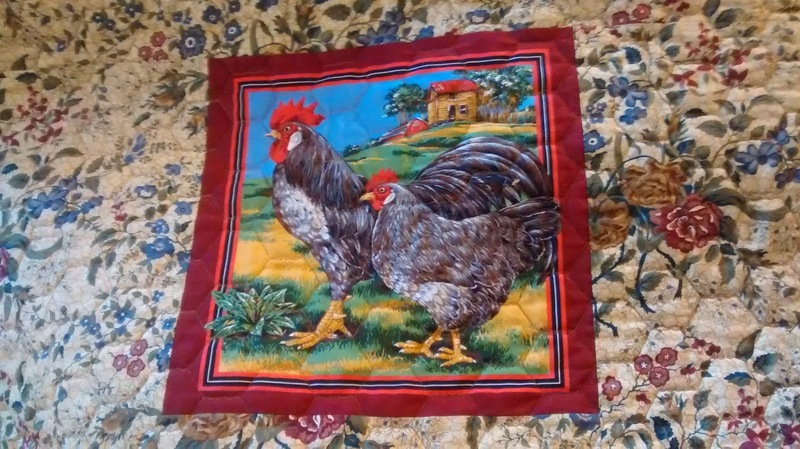 And of course, chicken wire was in order for the quilting pattern. Barb emailed hers to me at 10:30 Sunday. Now that's cutting it pretty close but she beat the midnight deadline. 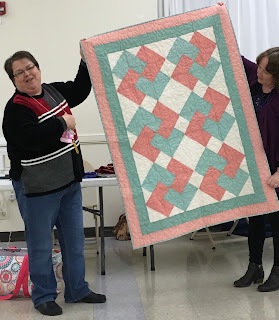 Barb is so happy to have this one finished. 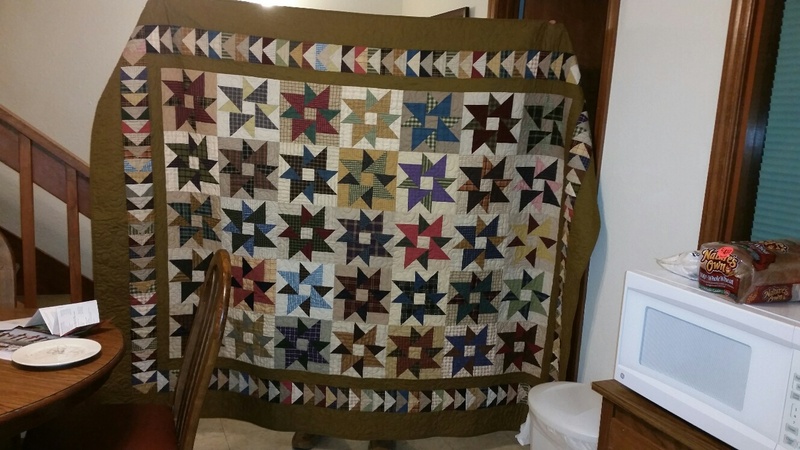 She says she still loves it in spite of the fact she's been working on it off and on for over 4 years. 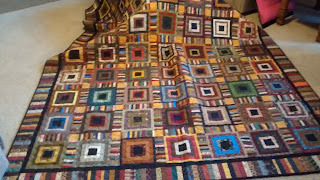 Sometimes when you work on a quilt that long, you hate it by the time it's finished. 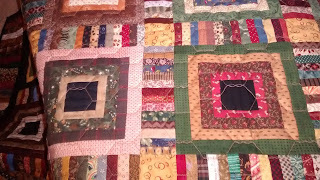 Next month I hope to get these two Flimsies quilted. They are small, that's why I picked 2. Another small charity quilt and a wall hanging. Do you think I can do it? Do you participate in challenges? It seems to be the only way I get anything done!